For more than two millenium, historians from Polybius to Hunt have been debating which pass Hannibal used to cross the Alps. 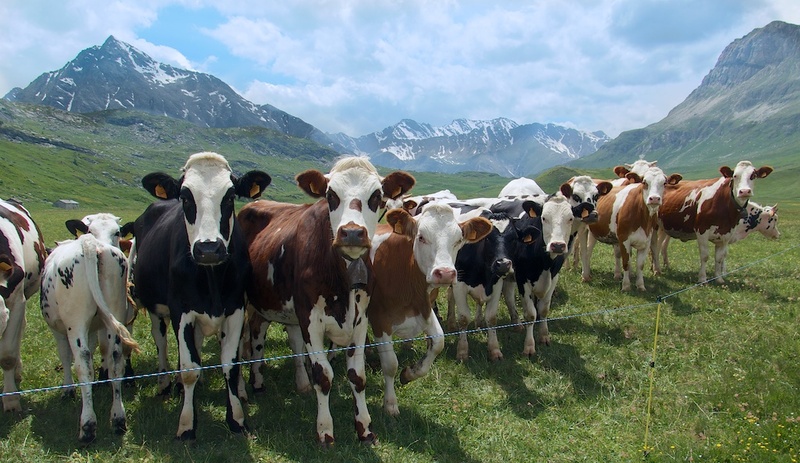 Napoleon thought it was Col du Mont Cenis, and the local tourist office agrees (photo below). Many others, including this guy, believe it was the more remote Col de Clapier (map at bottom). 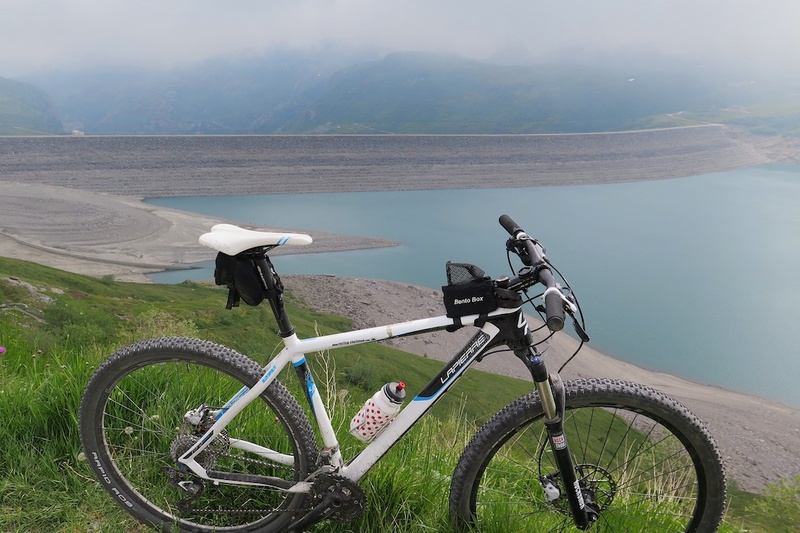 My goal today was to climb Col du Mont Cenis, visit the amazing side road to Col du Petit Mont Cenis, then leave the paved roads and see if I could get a bike up the “elephant” route to Col de Clapier. I started down in Lanslebourg in the French Haute-Maurienne (this is also the start of the climb to Col de l’Iseran). From here it is almost exactly 10 kilometres to Col du Mont Cenis (2083m). It’s a nice, steady climb and I felt fairly good, excited for an adventure. 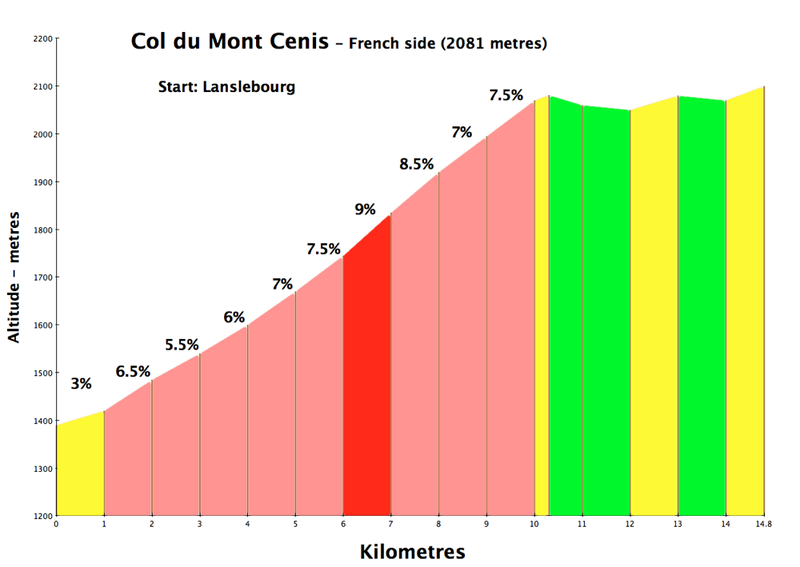 Note: the climb profile at left is only for the road climb to Col du Mont Cenis. 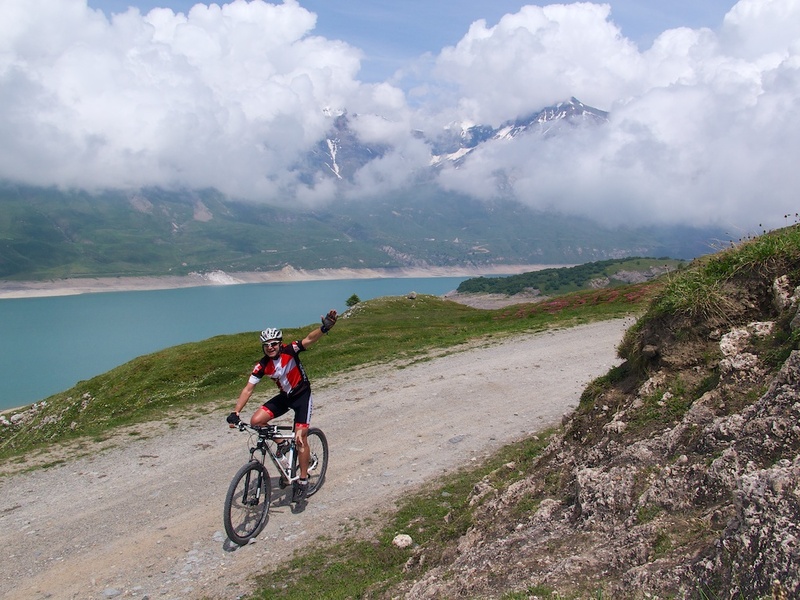 For road bikers, see here for both sides of Col du Mont Cenis including the huge Italian side, plus the highly recommended detour to Col du Petit Mont Cenis. Just after the Col is one of the most scenic little high alps roads I know. 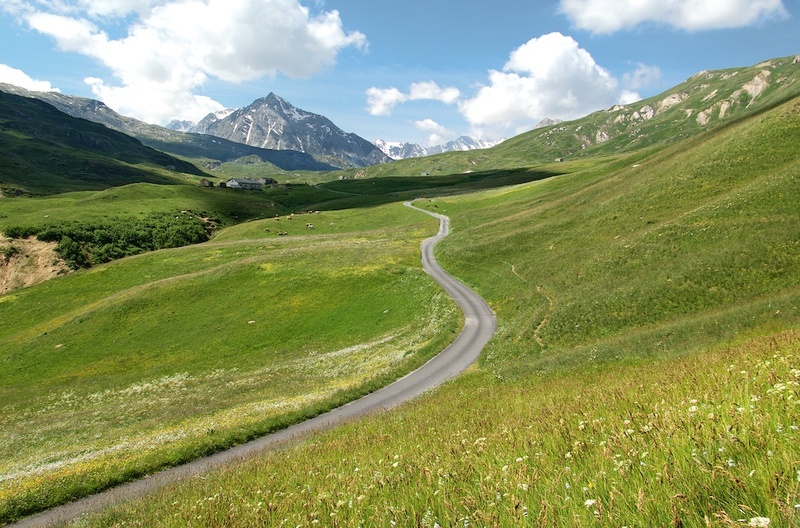 Don’t skip this turn off to Col du Petit Mont Cenis — paved until the Col (6.5 kms). It is not steep, occasionally downhill, but just lovely. See here for an old photo with lake behind me. At the Col is the old French/Italian border. I saw several steles marking this 1861 border. But all but the last few metres of my route would be in present-day France. The gravel road is an old military road. The French/Italian alpine border is littered with high altitude military roads dating from the late 1800’s and, especially from WW1. It is fairly rough but not particularly steep (sometimes even downhill). Col de Clapier is perhaps 8 kms from Petit Mont Cenis, and I only needed to gain a few hundred metres of altitude. But it is a fantastic environment. No development, deserted, surrounded by high mountains. After a while the old road ends. First, there is a marshy flat field to cross, and then the route continues up towards Lac de Savine on rocky hiking trails. I could ride stretches, but walked several parts. Never crazy steep though – walking was more due to big rocks in my way. At 2447 metres I arrived at Lac de Savine. A beautiful lake with high mountains on each side. It was getting cloudy and I struggled to take any good photos. But an impressive place. I was able to easily ride along the flat ground beside the lake to reach Col de Clapier, and the Italian border, on the far side. I briefly considered plunging into the clouds and descending into Italy, but the only thing I knew about the far side was that it was a very steep hike – and I still had other plans for the ride. 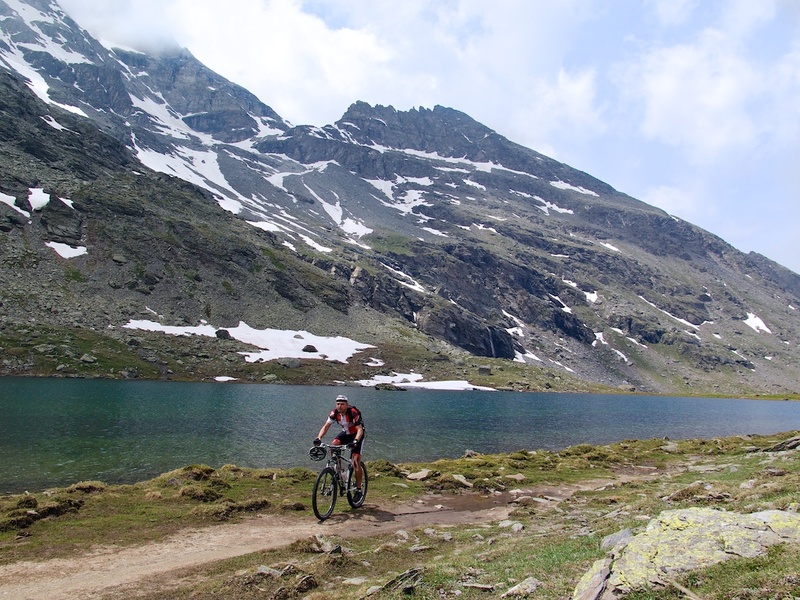 So I turned around to head back to Col du Petit Cenis (Colle del Piccolo Moncenisio). First stopping for a fun chat with a very friendly Italian-speaking fisherman. Friendly Italian Fisherman. Clapier behind. I stopped for Gelato and fluids at the Refuge du Petit Mont Cenis – the only restaurant above Lac de Mont Cenis. Descending the paved road there is a well signed turn off for the dam and a loop of Lac de Mont Cenis. People have been crossing Col du Mont Cenis for thousands of years. Both Constantine the 1st and Charlemagne crossed the Pass with armies. It was the most frequently used passage between Italy and France in the middle ages. During the Napoleonic wars, when the French ports were blockaded by the British after the battle of the Nile, Napolean ordered an improved road built over the pass. Finished in 1810, it allowed carts and carriages to be able to make the crossing. This is a good quality, gravel road. The lake’s water level was low, and the clouds rolling in, so again, I struggled to get good photographs here. But this loop is a lot of fun. Not difficult. Approaching the dam, the road passes under two huge old forts. In fact, if you pay attention, you can see several forts around the lake, as well as various old military constructions. I have marked a few forts on the map. 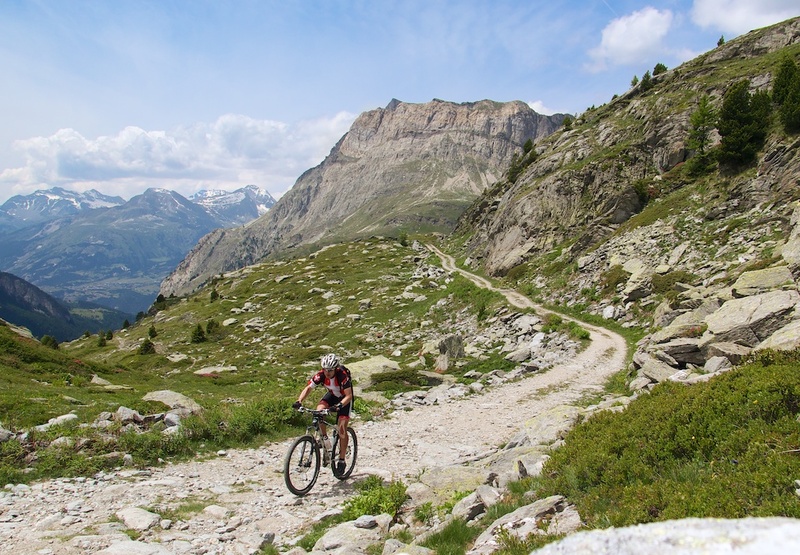 There are a couple of promising high mountain bike climbs here. It was possible to cycle across the top of the dam – again a gravel surface. And then with a little effort, climb through some old ruins to the main paved road on the far side of the lake. From the man road, it was simple enough to return to Col du Mont Cenis and descend back to the start. What a fun loop. I was feeling pretty pleased that I had made it to Col de Clapier.